Protect your carpet from stains and spills with a Carpet Protector upgrade. After a thorough deep steam cleaning from The Carpet Chemist, you’ll want to keep your carpets looking fabulous all the time! An application of carpet protector will repel spills and keep liquids on top of the fibers, so the fibers can’t absorb them. Don’t leave your expensive carpets to chance, especially with pets and children in your home. I guarantee accidents will happen, and you’ll be glad you made the surprisingly affordable investment. If you’ve ever purchased an expensive pair of boots for camping or hiking, you likely used a protective water repellent from an aerosol can to ensure any moisture will repel, keeping your boots dry, safe and clean. This is a bit different, but the same exact concept applies. No protector equals potentially damaged carpet. As a matter of fact, carpet manufacturers understand just how important protecting your carpet is, so nearly every bit of medium to high quality carpet that they manufacture at the mill, has a layer of protector applied to it. Now that doesn’t mean you never have to worry about carpet staining issues, because the life of the carpet protector is generally 3 to 5 years. Over time, it gets worn off of the carpet fibers, and when your carpets are professionally steam cleaned, most of it peels right off due to the high pH carpet cleaning chemicals and extremely high temperatures from the clean rinse water used. Our Carpet Chemist stain guard uses advanced technology that we think is pretty darn cool. After your carpets and upholstery have been freshly cleaned, we apply an even carpet protection spray that is precisely measured to work as effectively as possible, while leaving your carpets feeling as soft as new. 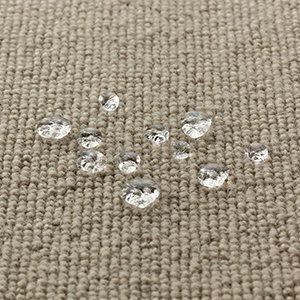 As the protector dries, it forms a coating around each and every carpet fiber, which repels spills, keeping them on top of the carpet, rather than being absorbed by the fibers. Without a protective coating, your carpet fibers will likely be subject to staining. If you are training a new family pet such as a puppy, i can’t stress enough how important this carpet protection step is. Our lifelong clients refuse to get their carpets cleaned without the stain guard applied. If you’d like a free demonstration of how our carpet protector works, we’d love to show you. It only takes a few minutes and your kitchen sink. Repels liquid. Carpet fibers with a protective coating will repel liquid spills, as opposed to the fibers absorbing the spills which set in and become stains. Durability. When carpet has a protective shield around the yarns, they dont abraise as easy, from dirt and other soils tracked in from the outside. Dirt acts like sandpaper and when you walk on it over and over each day it wares down the carpet fibers and you get what is known as a high traffic pattern, or worn area. Carpet protector shelters the fibers and adds years to the life of the carpet. Warranty. Most people don’t take the time to read the warranty when they purchase brand new carpet because it can be quite overwhelming. The fact is, many carpet types come with a stain guard on them and the warranty states that they must be professionally steam cleaned with protector applied, at least once a year. We actually recommend twice a year if you have pets and children.